MacMillan Provincial Park is a 301-hectare provincial park in British Columbia, Canada. Located 25 km west of Qualicum Beach and 16 km east of Port Alberni, the park straddles Highway 4 in central Vancouver Island. It is nestled on the western shore of Cameron Lake, and protects the delta of the Cameron River. The park is home to a famous, 157-hectare stand of ancient Douglas fir, known as Cathedral Grove, which draws visitors from all over the world. The park provides the only highway-accessible protected old-growth Douglas-fir forest in British Columbia. In 2007 Cathedral Grove made the short list on CBC television's competition Seven Wonders of Canada. The forests in the park are transitional between the drier Coastal Douglas-fir Biogeoclimatic Zone (CDF), which characterizes the east coast of Vancouver Island, and the wetter Coastal Western Hemlock Biogeoclimatic Zone (CWH), found along the island's west coast. Some of the trees are more than 800 years old and 9 metres in circumference. The flora of the park is typical of the region, and includes stands of old-growth tree species including western redcedar and bigleaf maple (found south of the highway), western hemlock, and grand fir. The understory (term for the area of the forest that grows in the shade the forest canopy) includes red huckleberry, salal, and devil's club. The park is home to several species of birds, including owls and woodpeckers; as well as such mammals as deer, black bear, elk and cougar. The Cameron River and Cameron Lake are stocked with rainbow, brown, and cutthroat trout. Indigenous peoples are believed to have used the area for ceremonial purposes prior to the arrival of European settlers in the mid-19th century. Evidence of "culturally modified trees", western redcedar trees which have had their bark stripped off, have been found and dated as far back as AD 1137. 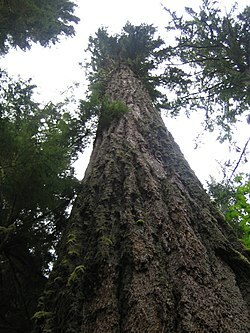 The name "Cathedral Grove" is reputed to have originated from the Governor General of Canada, Viscount Willingdon, in 1928, and appeared in correspondence to the provincial government in the 1920s. Cathedral Grove was a well-known tourist stop in the 1920s and 1930s, long before its protection. 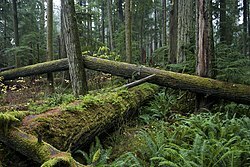 Over the following quarter century the public pressured and petitioned the provincial government to acquire the lands known as Cathedral Grove, and for the property and timber owners to donate the land. H.R. MacMillan, who had served as first chief forester of British Columbia and became a well-known forester and logging industrialist as head of the H.R. MacMillan Export Company (later MacMillan Bloedel), after years of refusing to consider the public demands, in 1944 donated the 136 hectares of his company's timber holdings "for the perpetual enjoyment of the public in recognition of the unique stand of trees." In 1947 the area was established as a Class A provincial park. Logging of the remainder of the valley upstream of the park throughout the late 20th century resulted in significant damage to the forest adjacent to the Cameron River. Extreme runoff from a 1990 tropical storm resulted in extensive flooding and streambank erosion, and 6 hectares of tree blowdown. In 1996 high winds caused extensive damage to the grove and surrounding forest. In the 1990s BC Parks initiated a trail rehabilitation program to prevent further damage from park visitation. Visitor parking has traditionally been along both sides of the narrow highway just west of the Cameron River bridge, a condition that by the 1990s was judged to be dangerous for tour buses, cars, and loaded logging trucks. In 2003, a plan by the BC Government to build a new parking lot to service the park was met by protest from environmental groups. In the current arrangement, the park's estimated one million annual visitors are served by a road-side pullout-style parking lot. Government officials claim that the safety of tourists as well as passing motorists are threatened by the layout, and are seeking to build a new parking facility. The current plans for the lot involve the construction of a 5-hectare parking lot approximately 1.5 kilometres from the park. Critics claim that the construction will decrease the number of visitors to the park, and threaten the habitat and feeding grounds of the local elk population. In May 2004, the beginning of construction was halted by a protest organized by a coalition of environmental groups. The permanent protest involves a tree-top platform which is continuously occupied. Wikimedia Commons has media related to MacMillan Provincial Park. Cathedral Grove Cathedral Grove, British Columbia.